Did you know God has a plan for amazing health, weight loss, and vibrant health? Have you ever tried to get your kids to eat healthy? One day, years ago, I thought it was time for my kids to try spinach…from the can, of course. My six-year-old son had chosen to be a picky eater, and he did not trust my choice of vegetables for the evening meal. required to try everything I served, so he obediently took several bites. He was not enjoying it. After several bites his face became distorted, his cheeks grew larger, and he threw up the spinach across the table…right at his younger sister. Then I had two kids who no longer enjoyed spinach. Needless to say, we never had canned spinach again. Have you had similar experiences at the dinner table? Has God been tugging at your heart to make some diet changes but you don’t know how? Change can be confusing. Did you know that what you feed your family can contribute to your kids suffering from common illnesses or even tragic health problems? Are you ready to look to the Scriptures and unveil the health plan God has designed just for you? Several years ago I was in your seat. We were a family battling many health challenges such as cancer, severe PMS, depression, Osgood Slater’s disease, multiple cavities, lethargy, muscle complaints, high cholesterol, acid reflux, weight issues, and other more serious health problems. It tires me out just thinking about all the problems we had and yet we were considered “normal.” On the outside, we appeared as a normal healthy family but inside we were sick and needed answers. God was tugging at my heart and mind to prepare better meals for my family and therefore improve our health. But I didn’t know how. I looked into some health food stores only to feel like I was abandoning my faith and going into New Age. Some of the food looked weird. If I served sprouts for dinner my family would be fighting for the phone to order a pizza. Praise the Lord, that all changed. Through the next several years God placed strategic people into my life. I was mentored and taught how to search the Scriptures with a focus on health. These new answers matched what I had studied in college. Once the Bible became my foundation, the food and nutrition fell right into place. • Learn 3 Simple Biblical Principles that will change how you view food forever. Think of God's Word as a treasure map that leads straight to the healthy life you've always dreamed of. It reveals how you can move from a sticky, lackluster life to one that is full of energy and hope. 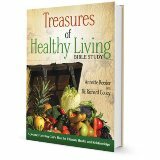 This practical Bible study will reveal the truth about the foods you eat and provide simple tools to begin improving your physical, emotional, and spiritual health. You won't believe how much life can change when you grab hold of the treasures God has provided for you. "For over 30 years my wife and I have been using the bible as our ultimate guide of health. We believe God has provided His dietar laws for our benefit and are convinced our lives are much healthier as a result. The teachings of biblical nutritionist, Annette Reed, are a must for any believer or Christian organization desiring to learn more about healthy living from a Scriptural perspective. It's a rewarding journey you won't want to miss." Start Your Healthy Living Journey from the Bible Today!